Press release: Feedback for Jeff! 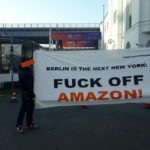 – One week left until the protest rally against the award ceremony for Jeff Bezos by Axel Springer - Make Amazon Pay! BILD celebrates Bezos? We will stand up against it! Make amazon pay! The preparations by the „Make Amazon Pay” campaign against the awarding of the “Axel-Springer-Award” for Jeff Bezos are in full swing. On 24 April 2018, the European Axel Springer publishing house is organising a very special celebration. Guest is the richest man in the world, Jeff Bezos, head of the global online trading company Amazon. 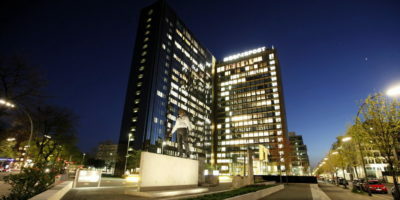 The Springer Prize is intended to honour Bezo’s “visionary business model”. 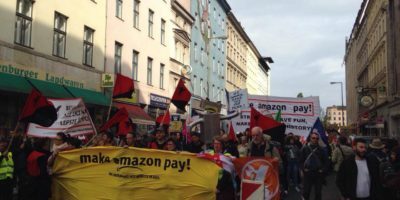 Leading up to the protest, “Make Amazon Pay” has connected with fighting workers in Germany and other countries. “We are showing our solidarity with the Amazon workers facing ongoing disputes”, says Maria Reschka, spokesperson for the campaign “Make Amazon Pay”. The activists stress that what is going on with Amazon exemplifies the struggles of many workers in today’s labor market: animosity towards unions, patronizing in the workplace and control over people through machines through surveillance and data-ization. Since Amazon holds a monopoly in the mail-order industry, it could set standards concerning work conditions. Instead, working for Amazon can lead to serious psychological strain and other health issues. The campaign is calling for the public to take part in the protest rally on the 24th of April at 4 PM from Oranienplatz to the Axel Springer building (Axel-Springer-Straße 65). Under the motto “Feedback for Bezos”, the solidarity groups together with the “Amazing Workers” and the employees from Poland will loudly protest against the award ceremony at 6 pm. Amazon puts massive pressure on employees through regular (negative)’feedback’ talks about their work performance, this time they all want to give Jeff Bezos “feedback” together. “Amazon does not only stand for a bargain or for not paying its taxes. Amazon also stands for a future built on exploitation, control and oppression”, emphazises Marie Reschka, spokesperson for the campaign.